For the second time in a month I get to be a guest percussionist with the University of Alabama Percussion Ensemble directed by Tim Feeney. The concert is presented by Sonic Frontiers and features guest artist Greg Stuart. We’re performing Hearing Metal 3 by Michael Pisaro. 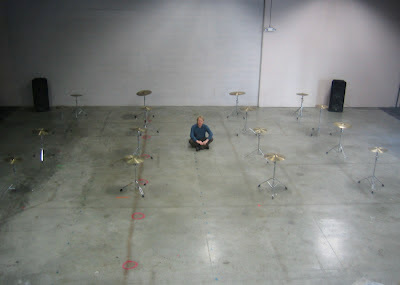 The work is for 16 suspended cymbals and electronics. The cymbals are bowed and activated by dropping beans, rice and millet on them. Such amazing sounds! Greg described one part of it in rehearsal as “listening to a radio tuned between stations.” If you know and love that sound (you know who you are), then you’ll understand why I’m so excited about tonight’s performance. If you’re bewildered or intrigued, you should come hear this. You’ll never listen to your radio (or look at beans, rice and millet) the same way again. The Grocery and Sonic Frontiers present a series of monthly participatory workshops beginning tonight and running until June 10. These casual, exploratory music sessions will provide an open and low-pressure environment for interested attendees to investigate improvisation, new compositions, interactive electronics and other musical practices through focused listening, discussion, and hands-on engagement. The workshops take place at 7 p.m. on the second Wednesday of each month at The Grocery, an artist-run studio, exhibit, and performance space located at 900 Main Avenue, two blocks north of the main intersection in downtown historic Northport. Bring your instrument, or just come to listen. No previous experience is necessary. The workshops are free and open to the public (a $1-$10 donation is suggested). Allan Kozinn get’s it in yesterday’s NYTimes article about John Cage’s 4’33”. …I sat back, closed my eyes and did what Cage so often recommended: I listened. I made no effort to separate the strands of conversation or to focus on what people were saying. I was simply grabbed by the sheer mass of sound, human and mechanical. It sounded intensely musical to me, noisy as it was, and once I began hearing it that way, I couldn’t stop.